A little over 7 years ago my friend and brother firefighter received the phone call no parent wants to receive. His new born daughter had been diagnosed with meningitis and during the course of her hospital admission had suffered a major stroke that would leave her with lifelong deficits. I see firsthand the difficulty that this family has faced and currently endures on a daily bases. But I also see the endless joy that Maddy brings to everyone she encounters. Maddy has an infectious smile that lights up any room. Her story is an inspirational one. She has had to fight valiantly since she was 2 months old. Maddy struggles with limited sight and courageously overcomes debilitating seizures, yet she is growing up a vibrant, beautiful girl. Standing beside her parents is the medical team at Boston Children’s Hospital who have been with Maddy and her parents each step of her journey. Derek and Chrissy Loftus have placed their faith, and literally their daughter’s life in Boston Children’s Hospital. 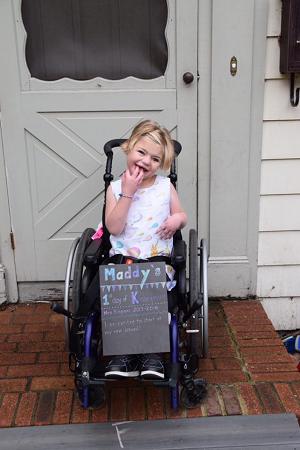 Thankfully, organizations like the Credit Unions Kids at Heart provide the necessary financial support to research pediatric brain disorders, helping patients like Maddy. The Loftus’s believe with their help and support that one day their work fundraising will enable doctors to find a cure for several pediatric brain disorders. Maddy and her parents have encouraged me to help join this great cause. This will be my second year running with the Credit Unions Kids at Heart team. Over the two year working with this organization I have seen how their amazing work is making a difference in children’s lives. They have inspired me once again to continue my work fundraising for a great cause. I will be rewarding myself again with a little run once my goals have been reached. We need your help to raise funds to help this amazing girl and many others. Please make a gift today.